With the aid of our technically advanced and capable team of executives, we are continuously affianced in presenting an inclusive and comprehensive array of Chocolate Packing Tray. In conformity with the standards defined by the industry, these offered trays are made with perfection. Together with this, these are shipped by us in pristine class packaging to retain their efficiency and flawlessness. 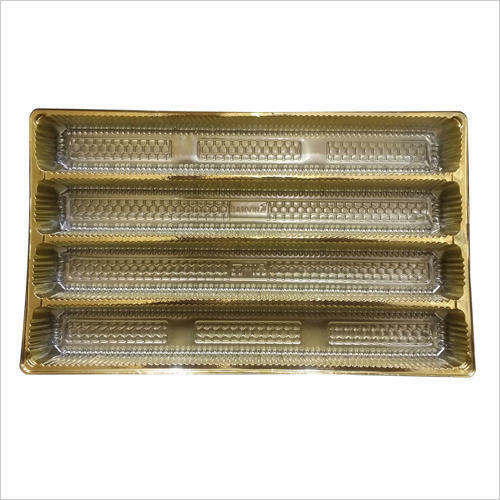 Owned with robust infrastructural facilities, combined with quality consciousness, we, Shankar Polymer Pvt Ltd, a trusted Manufacturer of a wide range of Sweet Tray, Metalized Tray, PVC Film etc. We launched into business operation in 1994. Our entire product range is manufactured by the layout high-quality raw material under the able guidance of highly skilled professionals. We have hired a team of qualified and trained professionals, who have in-depth domain knowledge and years of experience. Working in perfect harmony, the team maintains high standards in terms of manufacturing and quality so that we can ensure the delivery of superior quality products within the given time limit. Moreover, our company also has the circumspect layout for quick and safe storage as well as timely delivery of bulk products to client destination.